Anything But Climate Change . 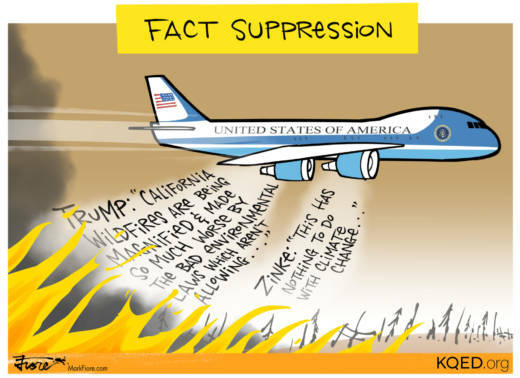 . .
After President Trump blamed California's raging wildfires on "bad environmental laws," Interior Secretary Ryan Zinke said the fires "have nothing to do with climate change." Climate scientists, however, have established a firm connection between climate change and California's raging megafires. Zinke advocated better forest management and lamented years of fire suppression, a position he has in common with many larger environmental organizations. The Trump administration's budget proposal for 2019, though, threatens the existence of a U.S. Forest Service program dedicated to forest management.